The proposed idea is a living sculpture that is directly connected to the functions of the lagoon. It is a sculpture made from water mist and sound. It is an experience that is triggered by the existence of the lagoon and the infrastructure at work, rather than the natural rhythm – tidal waves – that we have taken for granted. The operation of the energy harvesting mechanism is interpreted as a ‘second nature’ that is subordinate to the natural phenomenon of tidal waves. This ‘second nature’ is our ecological response to the increase in energy consumption and the consequences of exploiting natural resources. The proposed idea therefore represents this environment, a synergy of human and natural forces. It is a mist sculpture that exists only when the energy mechanism is at work. The form of the sculpture would be defined by the energy generated. When the harvesting mechanism halts, the sculpture would cease to exist. The use of water droplets as a ‘material’ means the sculpture will change in different wind conditions and the experience varies slightly or dramatically on a daily basis. It conveys values of impermanence and mutual reliance. Visually it generates a soft and ephemeral presence. An aural experience emphasises a sense of time. By introducing a timed soundscape that complements or contradicts the existing sounds in the lagoon area, the sculpture becomes a sequence of events over a period of time. The soundscape provides a different dimension that cannot be expressed by the water mist, on a human scale. 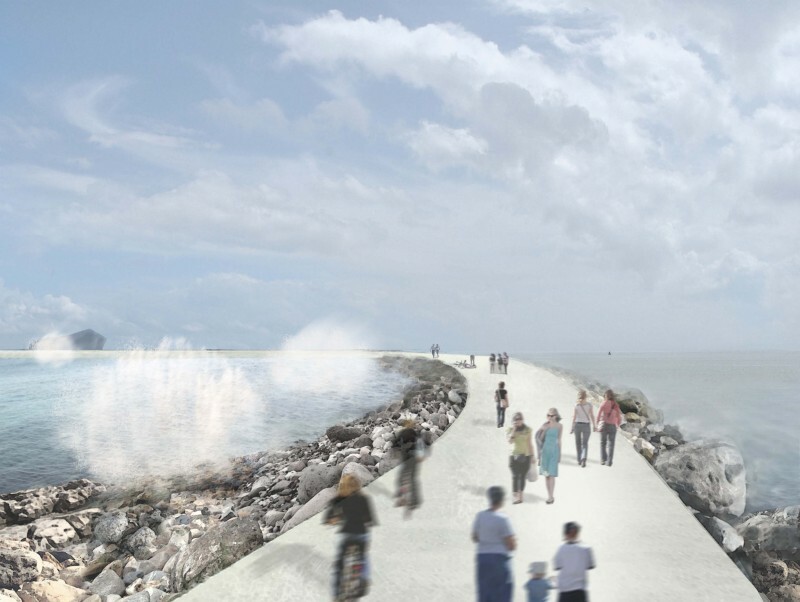 Rooted in Wales and its people, the soundscape will be amplified when the water mist is absent, creating a promenade experience that is culturally distinct.